We have a perfect central location in Centurion, not in town but in the calm and rest full atmosphere of the surrounding Equestrian estates. 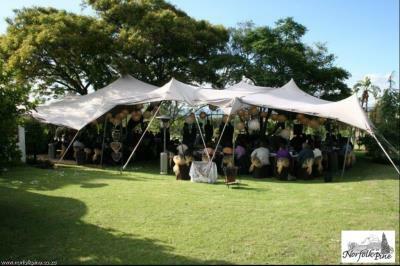 The conference facility comprises a thatch structure that is imminently suited to creating a relaxed atmosphere for conferences and is ideal for groups between 10 and 30 people. A sparkling pool and garden compliments the facilities and provide breakaway areas for groups. There is a small porch area for smokers and it is separated from the mail house by the living room. Coffee, tea and luncheon snacks, all of which are handmade, can also be offered on request. Business and corporate functions are also extremely successful, not only because of the location but also because of the variety of services on offer. Conference facilities are excellent for intimate groups. We easily accommodate small events 30 - 50 people. For bigger groups, we can expand into the open garden area. Catering services are available. With the experienced Norfolk Pine team at your service, you are guaranteed a wonderful relaxing time at this great venue in Centurion.